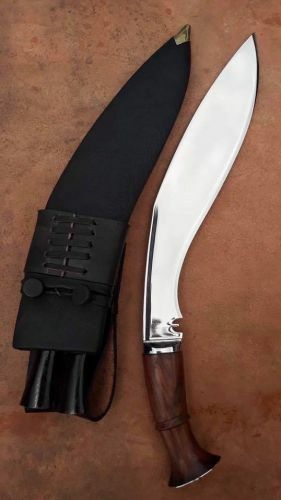 Tora's WW Battalion Issue kukri is a replica of a WW1 1/6th Gurkha Battalion issued kukri which was probably picked up by a British Soldier in the Gallipoli campaign in WW1. The kukri it is based on belonged to Gurkha 843 Gurung of B Company. This style of kukri was used in both World Wars and the kukri we have based the Tora model on may well have been present at the famour battle of Sari Bair in 1915. The Tora WW1 1/6 Battalion kukri generally has a 33cm long blade with a belly of approx 6cm and weight range of approximately 540 - 615 grams. It has a stick tang wooden handle and comes with a military scabbard and frogs and Chakmak & Karda utility knives.